1. The Bomaderry Zieria – a rare and curious plant! 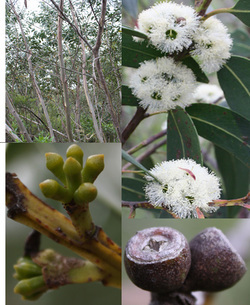 In 1883 when William Baeuerlen collected a specimen from a Zieria shrub growing near Bomaderry Creek, he would have had no idea that this previously unknown species would be named after him and of the interest his finding would inspire over a century later. 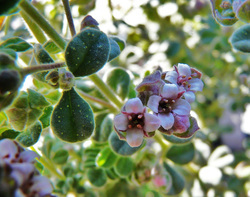 Zierias are related to boronias and, with their highly aromatic leaves, it may be of no surprise to learn that they are in the citrus family. Classified as endangered at both national and state levels, the Bomaderry Zieria (Zieria baeuerlenii) is totally endemic to the Bomaderry Creek Bushland where it was rediscovered in 1987 after being classified as ‘presumed extinct’. It was originally thought to be a hybrid of two other closely related Zieria species, but this was proved to be incorrect when environmental scientist Terry Barratt completed 2-year post-graduate work on the species in 1999. Many important conservation biology questions were examined by Terry such as: how does the species propagate, does it set seed, is it a distinct species or is it a hybrid, why is it not found elsewhere and what are the threats to its survival? Some answers were clear: it does not set seed; it propagates mainly by suckering and occasionally by layering; it is a distinct species and the population consists of 22 clonal groups. Subsequent work by Terry, under contract to the National Parks & Wildlife Service, revealed evidence that drought was a serious threat to the species and that an occasional fire may be beneficial. Direct human threats to the species are vandalism and, of course, a proposed road through its habitat.